Valentine's Day can be a big drag if your love life is taking a breather. So for everyone who doesn't have a signifi other to swoon over you on Valentine's Day - this one's for you! It's a delicious, yet not too rich version of the classic decadent heart brownie. This little heart is are all bruised up with blackberries and blueberries. In a small bowl mash half of the portions of fresh berries, add brandy and agave syrup. Set aside. 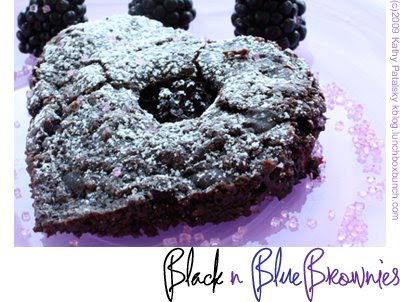 Mix brownie mix with canola oil, blueberry yogurt, applesauce (or eggs), water. Fold in a few fresh berries, but leave a few for a top layer. Pour mix into greased brownie tin. Add a layer of fresh berries-push deep into the batter. Sprinkle a thin layer of raw or white sugar on top before baking. Use heart-shaped cookie cutter to cut brownies. **Blueberries and blackberries are high in anti-aging free radical-fighting antioxidants. If you are using a high quality dark cocoa, you are getting triple the antioxidant protection! Berries and chocolate -- super foods!